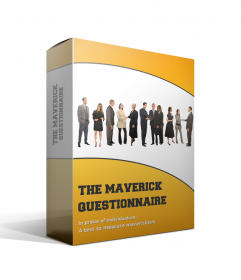 Professor Chris Jackson celebrates individualism with The Maverick Questionnaire (TMQ). So much of modern business revolves around teams and teamwork. For most people, this might be associated with good performance and useful work outcomes. However, some people at work are not teamplayers and many would even call themselves workplace mavericks who have the individual talents to be more successful than a team if only they were allowed to work on their own. This selection system can be used for selection, training and development of high performing individualists who see the world in their own unique and brilliant way such that they can do what a whole team of others can not. Unleash the pwoer of the brilliant individual today!